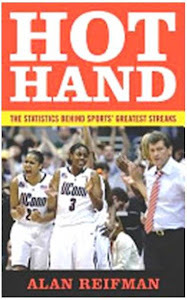 From today, Cyber Monday, until December 24, if you buy the book Hot Hand as a gift for someone, I will make a short video of myself dedicating the book to your chosen recipient and e-mail you the video, for free. Just e-mail me (alan.reifman@ttu.edu) after you've ordered the book, including the name (first-name only) of the recipient, along with any other information I could work into my dedication (e.g., recipient's favorite athlete or team). I'll e-mail you back the video clip and you can forward it to your recipient. As all NBA basketball fans undoubtedly know by now, the San Antonio Spurs are this year's champions, having dispatched of the two-time defending champion Miami Heat in five games. Red-hot shooting was the story for the Spurs. The Heat looked poised to capture a road victory in Game 1, leading 86-79 with 9:37 left in the fourth. The Spurs then proceeded to hit 6-of-6 on three-pointers (including three by Danny Green) and, before you knew it, San Antonio had won going away, 110-95. Miami won Game 2 by a 98-96 score, but that was the Heat's last hurrah. In Game 3, the Spurs hit 75.8% of their shots from the field in the first half, an NBA record for a half of a finals game. This shooting exhibition gave San Antonio a 71-50 lead at the break, en route to a 111-92 rout. Game 4 (107-86) and Game 5 (104-87) were likewise blowouts. Miami, feeling great desperation on the brink of elimination, jumped out to a 22-6 lead in Game 5. However, San Antonio outscored the Heat 98-65 the rest of the way to clinch the title. 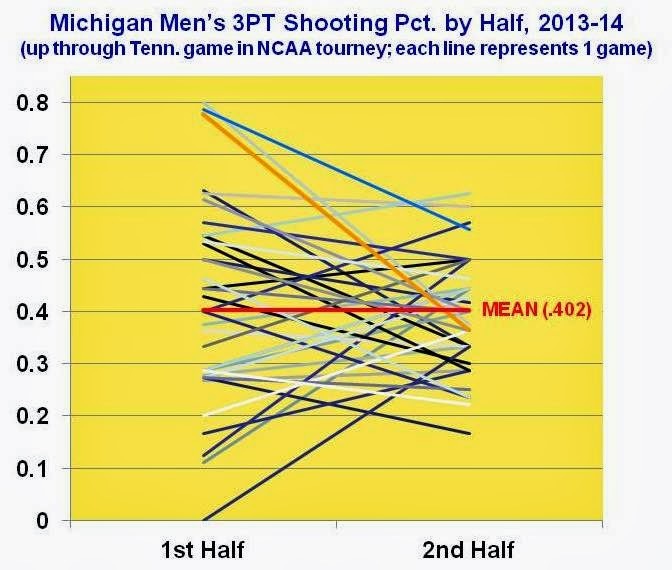 ESPN The Magazine's annual "Analytics Issue" (March 3, 2014) includes an article by Ken Pomeroy on when team scoring runs are most likely to occur in college basketball. Pomeroy focuses on runs of at least 10-0 (i.e., one team scoring 10 straight points without any scoring by the opponent), although other analysts might differ either on the minimum number of points by the "hot" team needed to constitute a run or on whether the shutout element is necessary for a run (i.e., some would consider outscoring a team by a margin of 15-2, for example, during a stretch to be a run). Using the 10-0 criterion and voluminous data from recent seasons, Pomeroy examined, among other things, the probability of teams going on a run, depending on whether they were winning or losing (and by how much) or tied. He found small, but steady, differences, comprising an unmistakable trend. 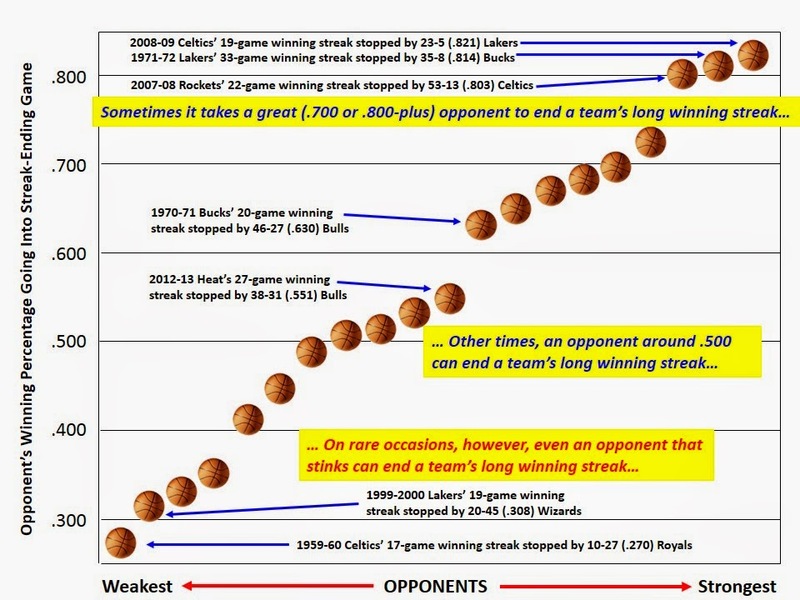 The more a team was behind, the higher its probability of going on a 10-0 run, and the more a team was ahead, the smaller its probability. A team trailing by 10 points had approximately a 1.86% chance of going on such a run, a team trailing by 9 points had roughly a 1.76% chance, a team 8 points behind had roughly a 1.72% chance, and so forth (the reason these percentages are approximate is that the exact values are not listed and I am estimating them visually from the heights of bars on a graph). In a tie game, a team has about a 1.24% chance of a 10-0 run. A team with a 1-point lead had around a 1.20% chance, one with a 2-point lead had roughly a 1.16% chance, and so forth. Finally, a team up 10 had approximately a 0.88% chance. Whereas my horizontal axis was structured the same as Pomeroy's, depicting how many points behind (negative values) or ahead (positive values) a team was right before launching its run, I used a different measure of run intensity on the vertical axis. As I noted above, he looked at probability of a 10-0 run. Instead, I plotted the margin of a given run (e.g., outscoring an opponent 16-3 during a run would be recorded as +13). The graph appears below, the background ranging left-to-right from darker red for larger deficits to darker green for larger leads. You may click on the graph to enlarge it. Each dot represents a particular scoring run. Three of the dots are annotated to provide examples of what all the dots represent. The downward-trending line, known as the best-fit line because it is close to as many of the dots as possible, shows the same pattern as Pomeroy's findings. 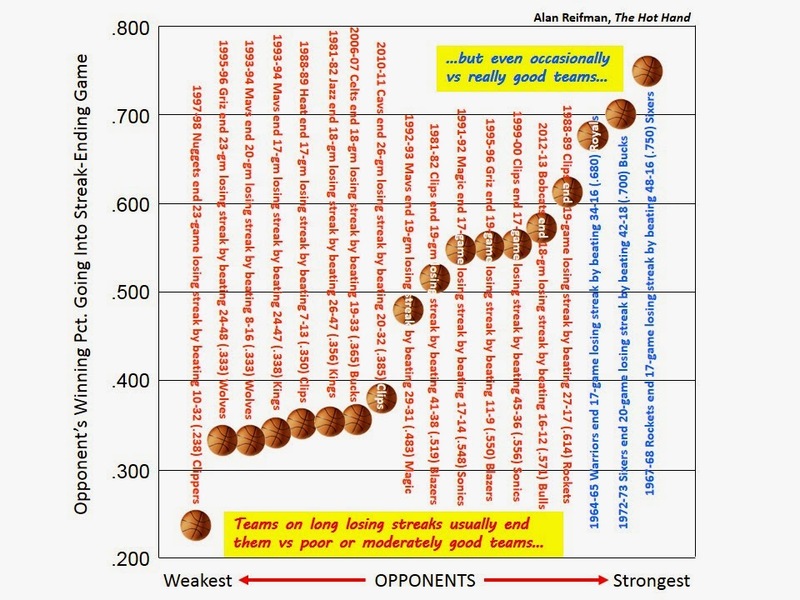 The further behind a team was, the greater its tendency to outscore the opponent by a huge margin. For those of you with some statistical training, the correlation between initial deficit/lead and margin of outscoring the opponent during the run was r = -.24, on the cusp of statistical significance at p = .051. Teams that were way ahead rarely went on a big scoring run. One exception, noted in the graph, is that Kansas, already leading 85-64, went on a 12-0 run against the University of Alabama-Birmingham to expand the Jayhawks' lead to 97-64. One reason teams with big leads rarely go on new scoring runs presumably is that they often take out their top players, both to rest them and to avoid the appearance of "running up the score" on the opponent. 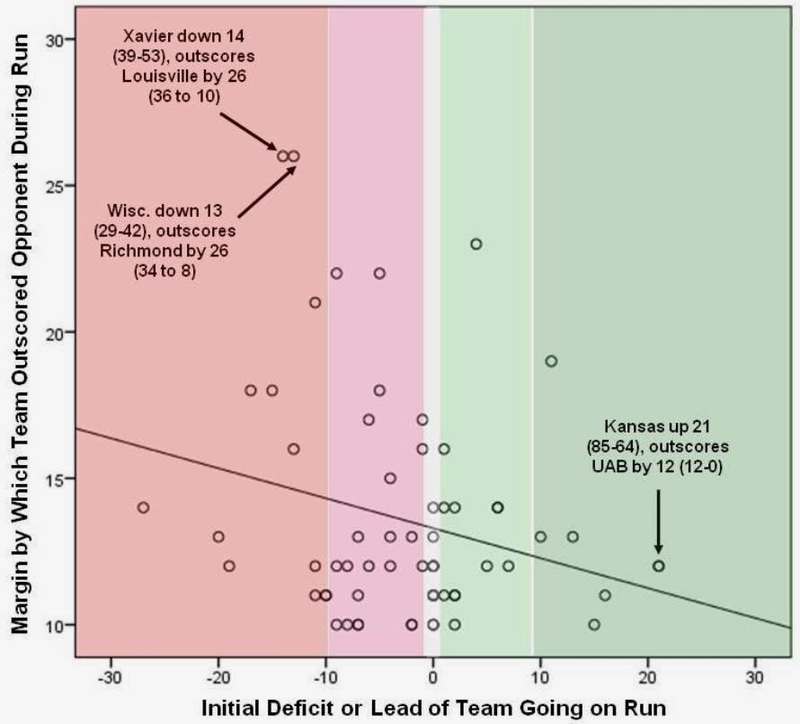 A second, more statistically based reason for why trailing teams are more likely than leading teams to go on runs is the concept of regression toward the mean. Regression toward the mean tells us that, even absent any intervention, both extreme low performers (i.e., the trailing team) and extreme high performers (i.e., the leading team) tend to return toward more average performances. An extreme low performer has nowhere to go but up, and an extreme high performer has nowhere to go but down. In conclusion, Pomeroy's and my investigations are very clear that trailing teams are far more likely to go on scoring runs than are leading teams. Psychological factors suggested by Pomeroy (e.g., motivation on the part of the trailing team and the desire to conserve energy by the leading team) and regression toward the mean are likely explanations of the basic finding, but it is difficult to know the relative importance of the two explanations. *In revisiting the play-by-play sheets from the 2004 NCAA tournament, I noticed a few slight discrepancies with what appeared in my book. For example, a game article on the Mississippi State-Monmouth contest stated that, "The 15th-seeded [Monmouth] Hawks shot their way within four points late in the first half, but Mississippi State pulled away by controlling both ends of the floor. The Bulldogs tore off a 22-5 run in less than 10 minutes, and cruised to their largest margin of victory of the season." Based on the game article, I listed Mississippi State's run as 22-5 in my book. However, the article's qualifier "in less than 10 minutes" was more important than I realized at the time. If one looks at the play-by-play sheet, one sees that Mississippi State indeed outscored Monmouth 22-5 in the roughly 10:00 window of time from 4:47 left in the first half (MSU up 36-32) to 15:23 left in the second half (MSU up 58-37). However, what I did not notice until revisiting the play-by-play sheet for today's analysis is that Mississippi State added 6 more unanswered points beyond the 10-minute window, making the full run really 28-5.Small discrepancies such as this were corrected for today's analysis.